Each of the biases is explained in the Wikipedia article below. CTRL-F to find the bias defined on this page. 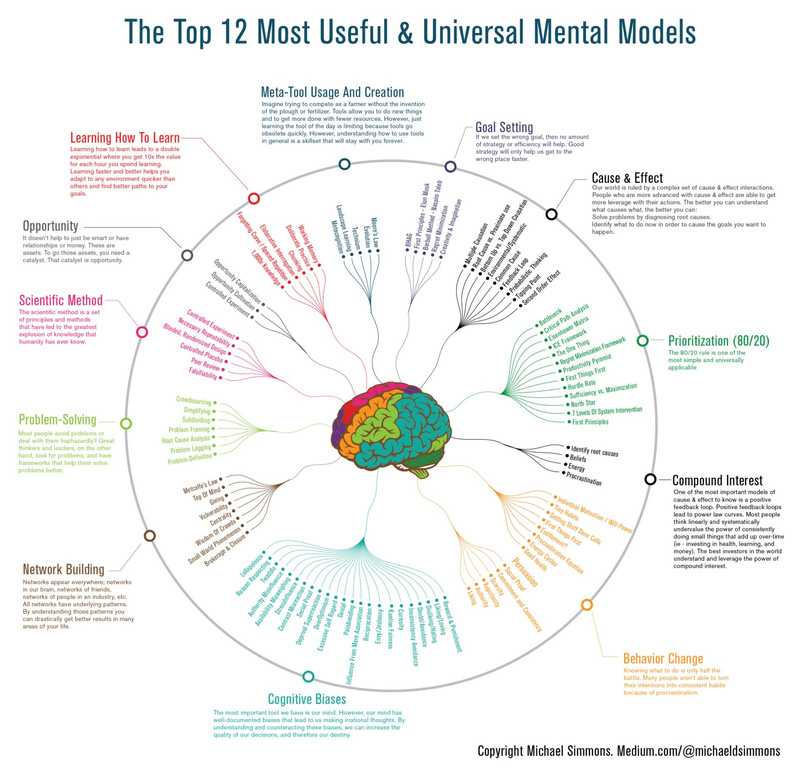 Click on the image to be taken to a high resolution image from Visual Capitalist. Clicking on the images below will expand them into a very readable format. View the high resolution version of today’s graphic by clicking here. The human brain is capable of incredible things, but it’s also extremely flawed at times. Science has shown that we tend to make all sorts of mental mistakes, called “cognitive biases”, that can affect both our thinking and actions. These biases can lead to us extrapolating information from the wrong sources, seeking to confirm existing beliefs, or failing to remember events the way they actually happened! To be sure, this is all part of being human – but such cognitive biases can also have a profound effect on our endeavors, investments, and life in general. 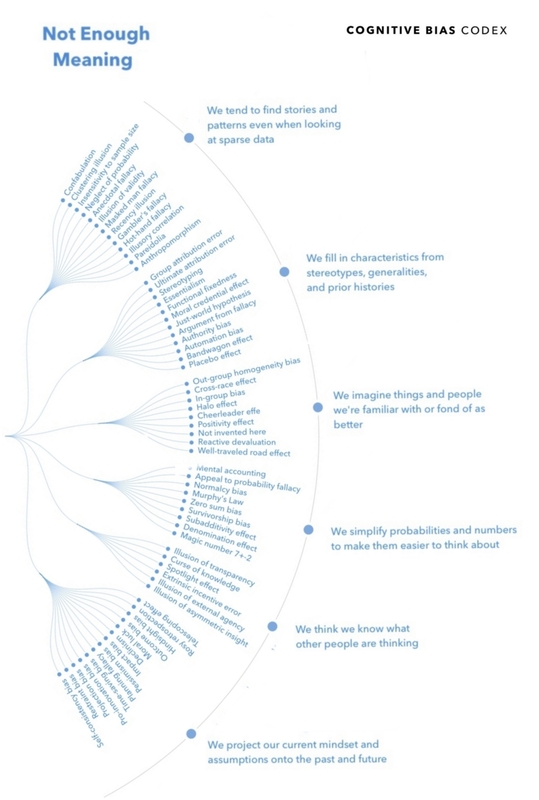 For this reason, today’s infographic from DesignHacks.co is particularly handy. 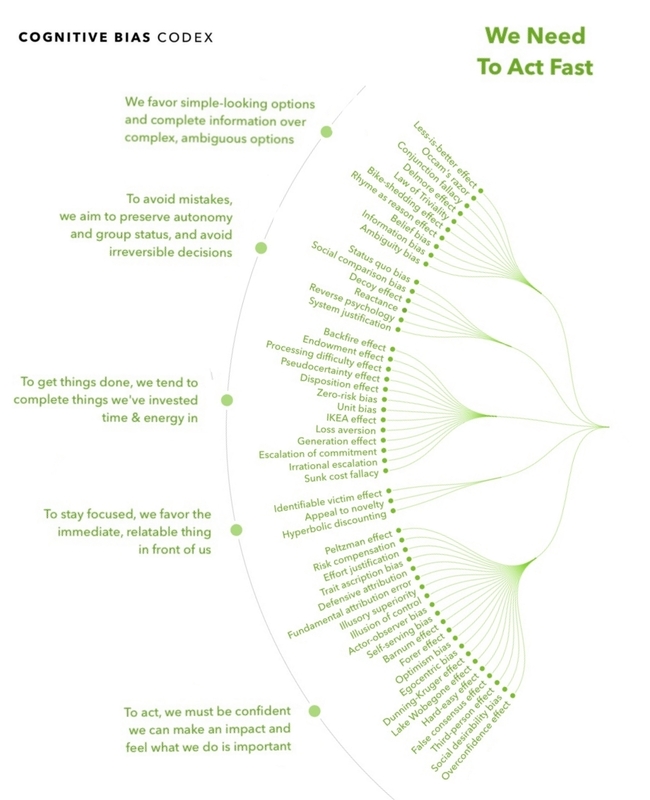 It shows and groups each of the 188 known confirmation biases in existence. Humans tend to think in certain ways that can lead to systematic deviations from making rational judgments. 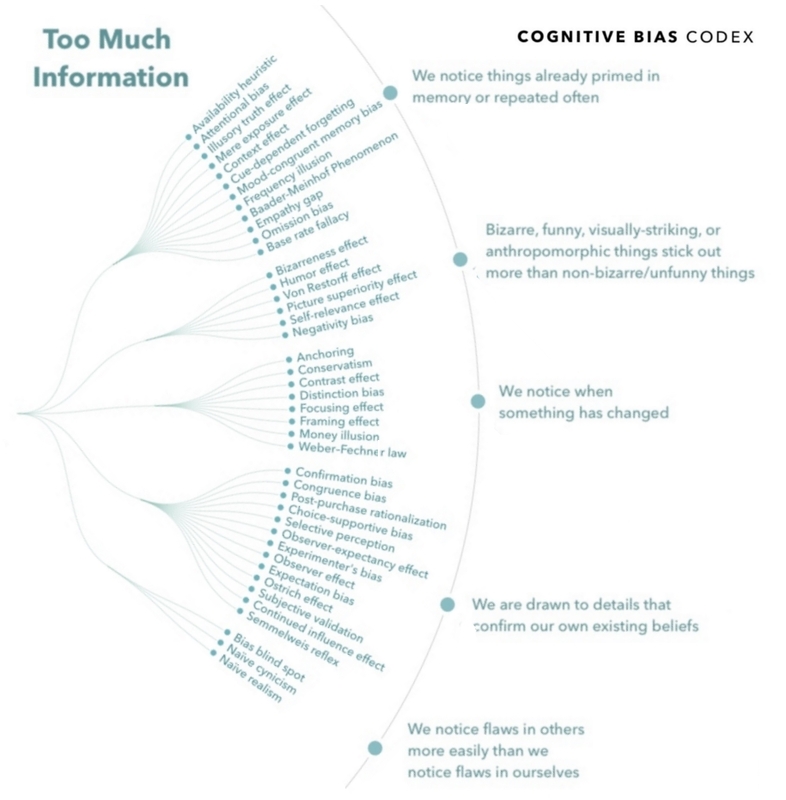 Cognitive biases have been studied for decades by academics in the fields of cognitive science, social psychology, and behavioral economics, but they are especially relevant in today’s information-packed world. They influence the way we think and act, and such irrational mental shortcuts can lead to all kinds of problems in entrepreneurship, investing, or management. Familiarity Bias: An investor puts her money in “what she knows”, rather than seeking the obvious benefits from portfolio diversification. Just because a certain type of industry or security is familiar doesn’t make it the logical selection. Self-Attribution Bias: An entrepreneur overly attributes his company’s success to himself, rather than other factors (team, luck, industry trends). When things go bad, he blames these external factors for derailing his progress. Anchoring Bias: An employee in a salary negotiation is too dependent on the first number mentioned in the negotiations, rather than rationally examining a range of options. Survivorship Bias: Entrepreneurship looks easy, because there are so many successful entrepreneurs out there. However, this is a cognitive bias: the successful entrepreneurs are the ones still around, while the millions who failed went and did other things. 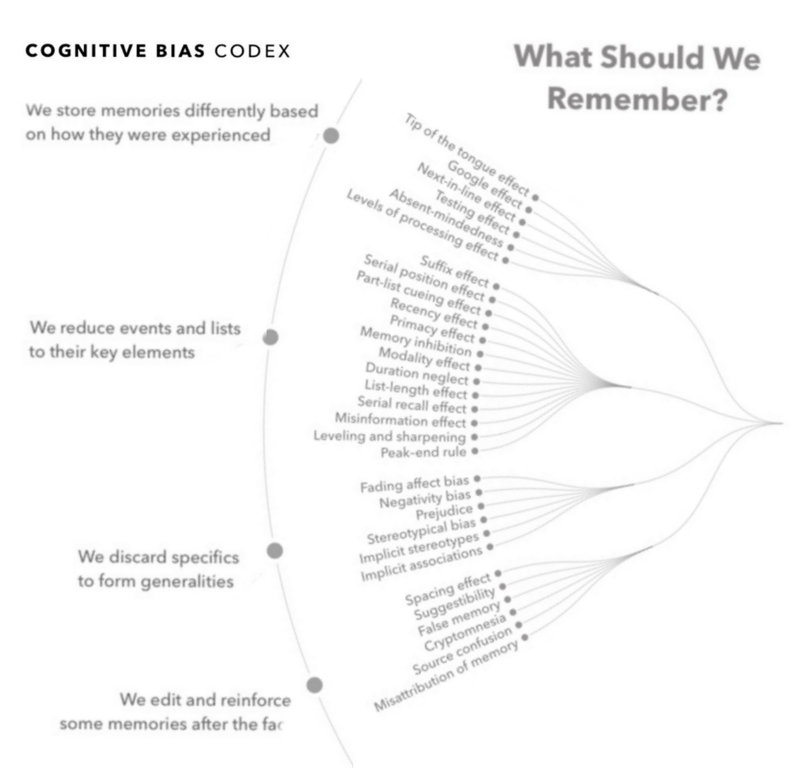 Cognitive biases can be organized into four categories: biases that arise from too much information, not enough meaning, the need to act quickly, and the limits of memory. Cognitive biases are systematic patterns of deviation from norm or rationality in judgment, and are often studied in psychology and behavioral economics. Although the reality of these biases is confirmed by replicable research, there are often controversies about how to classify these biases or how to explain them. Some are effects of information-processing rules (i.e., mental shortcuts), called heuristics, that the brain uses to produce decisions or judgments. Such effects are called cognitive biases. 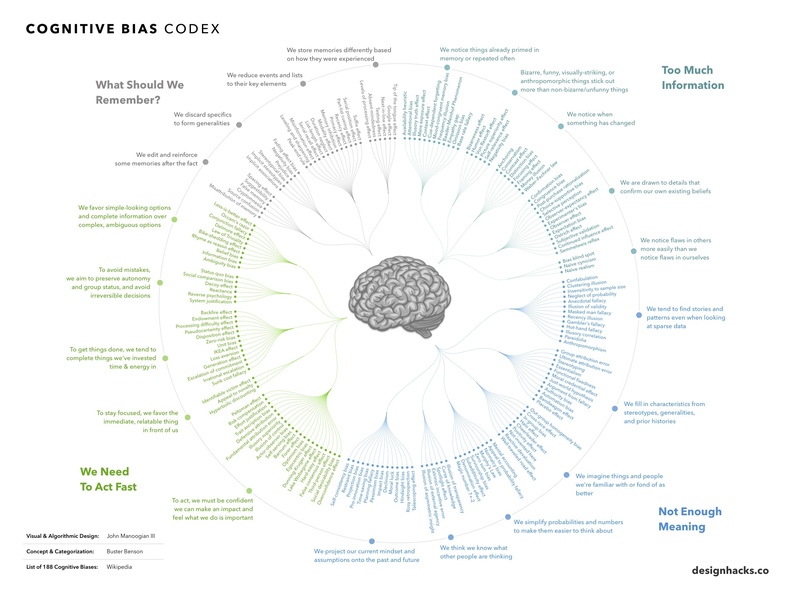 Biases have a variety of forms and appear as cognitive (“cold”) bias, such as mental noise, or motivational (“hot”) bias, such as when beliefs are distorted by wishful thinking. Both effects can be present at the same time. There are also controversies over some of these biases as to whether they count as useless or irrational, or whether they result in useful attitudes or behavior. For example, when getting to know others, people tend to ask leading questions which seem biased towards confirming their assumptions about the person. However, this kind of confirmation bias has also been argued to be an example of social skill: a way to establish a connection with the other person. Although this research overwhelmingly involves human subjects, some findings that demonstrate bias have been found in non-human animals as well. For example, hyperbolic discounting has been observed in rats, pigeons, and monkeys. Many of these biases affect belief formation, business and economic decisions, and human behavior in general. Declinism The belief that a society or institution is tending towards decline. Particularly, it is the predisposition to view the past favourably (rosy retrospection) and future negatively. Decoy effect Preferences for either option A or B change in favor of option B when option C is presented, which is similar to option B but in no way better. Frequency illusion The illusion in which a word, a name, or other thing that has recently come to one’s attention suddenly seems to appear with improbable frequency shortly afterwards (not to be confused with the recency illusion or selection bias). This illusion may explain some examples of the Baader-Meinhof phenomenon, when someone repeatedly notices a newly learned word or phrase shortly after learning it. Most of these biases are labeled as attributional biases. Actor-observer bias The tendency for explanations of other individuals’ behaviors to overemphasize the influence of their personality and underemphasize the influence of their situation (see also Fundamental attribution error), and for explanations of one’s own behaviors to do the opposite (that is, to overemphasize the influence of our situation and underemphasize the influence of our own personality). Authority bias The tendency to attribute greater accuracy to the opinion of an authority figure (unrelated to its content) and be more influenced by that opinion. Defensive attribution hypothesis Attributing more blame to a harm-doer as the outcome becomes more severe or as personal or situational similarity to the victim increases. Egocentric bias Occurs when people claim more responsibility for themselves for the results of a joint action than an outside observer would credit them with. False consensus effect The tendency for people to overestimate the degree to which others agree with them. Forer effect (aka Barnum effect) The tendency to give high accuracy ratings to descriptions of their personality that supposedly are tailored specifically for them, but are in fact vague and general enough to apply to a wide range of people. For example, horoscopes. Fundamental attribution error The tendency for people to over-emphasize personality-based explanations for behaviors observed in others while under-emphasizing the role and power of situational influences on the same behavior (see also actor-observer bias, group attribution error, positivity effect, and negativity effect). Group attribution error The biased belief that the characteristics of an individual group member are reflective of the group as a whole or the tendency to assume that group decision outcomes reflect the preferences of group members, even when information is available that clearly suggests otherwise. Halo effect The tendency for a person’s positive or negative traits to “spill over” from one personality area to another in others’ perceptions of them (see also physical attractiveness stereotype). Illusion of asymmetric insight People perceive their knowledge of their peers to surpass their peers’ knowledge of them. Illusion of transparency People overestimate others’ ability to know them, and they also overestimate their ability to know others. Ingroup bias The tendency for people to give preferential treatment to others they perceive to be members of their own groups. Just-world hypothesis The tendency for people to want to believe that the world is fundamentally just, causing them to rationalize an otherwise inexplicable injustice as deserved by the victim(s). Moral luck The tendency for people to ascribe greater or lesser moral standing based on the outcome of an event. Naïve cynicism Expecting more egocentric bias in others than in oneself. Naïve realism The belief that we see reality as it really is – objectively and without bias; that the facts are plain for all to see; that rational people will agree with us; and that those who don’t are either uninformed, lazy, irrational, or biased. Outgroup homogeneity bias Individuals see members of their own group as being relatively more varied than members of other groups. Self-serving bias The tendency to claim more responsibility for successes than failures. It may also manifest itself as a tendency for people to evaluate ambiguous information in a way beneficial to their interests (see also group-serving bias). Shared information bias Known as the tendency for group members to spend more time and energy discussing information that all members are already familiar with (i.e., shared information), and less time and energy discussing information that only some members are aware of (i.e., unshared information). Trait ascription bias The tendency for people to view themselves as relatively variable in terms of personality, behavior, and mood while viewing others as much more predictable. Ultimate attribution error Similar to the fundamental attribution error, in this error a person is likely to make an internal attribution to an entire group instead of the individuals within the group. Worse-than-average effect A tendency to believe ourselves to be worse than others at tasks which are difficult. Bizarreness effect Bizarre material is better remembered than common material. Choice-supportive bias In a self-justifying manner retroactively ascribing one’s choices to be more informed than they were when they were made. Childhood amnesia The retention of few memories from before the age of four. Consistency bias Incorrectly remembering one’s past attitudes and behaviour as resembling present attitudes and behaviour. Cross-race effect The tendency for people of one race to have difficulty identifying members of a race other than their own. Cryptomnesia A form of misattribution where a memory is mistaken for imagination, because there is no subjective experience of it being a memory. Egocentric bias Recalling the past in a self-serving manner, e.g., remembering one’s exam grades as being better than they were, or remembering a caught fish as bigger than it really was. Fading affect bias A bias in which the emotion associated with unpleasant memories fades more quickly than the emotion associated with positive events. False memory A form of misattribution where imagination is mistaken for a memory. Generation effect (Self-generation effect) That self-generated information is remembered best. For instance, people are better able to recall memories of statements that they have generated than similar statements generated by others. Google effect The tendency to forget information that can be found readily online by using Internet search engines. Hindsight bias The inclination to see past events as being more predictable than they actually were; also called the “I-knew-it-all-along” effect. Humor effect That humorous items are more easily remembered than non-humorous ones, which might be explained by the distinctiveness of humor, the increased cognitive processing time to understand the humor, or the emotional arousal caused by the humor. Illusion of truth effect That people are more likely to identify as true statements those they have previously heard (even if they cannot consciously remember having heard them), regardless of the actual validity of the statement. In other words, a person is more likely to believe a familiar statement than an unfamiliar one. Illusory correlation Inaccurately remembering a relationship between two events. Lag effect The phenomenon whereby learning is greater when studying is spread out over time, as opposed to studying the same amount of time in a single session. See also spacing effect. Leveling and sharpening Memory distortions introduced by the loss of details in a recollection over time, often concurrent with sharpening or selective recollection of certain details that take on exaggerated significance in relation to the details or aspects of the experience lost through leveling. Both biases may be reinforced over time, and by repeated recollection or re-telling of a memory. Levels-of-processing effect That different methods of encoding information into memory have different levels of effectiveness. Misinformation effect Memory becoming less accurate because of interference from post-event information. Modality effect That memory recall is higher for the last items of a list when the list items were received via speech than when they were received through writing. Mood-congruent memory bias The improved recall of information congruent with one’s current mood. Next-in-line effect That a person in a group has diminished recall for the words of others who spoke immediately before himself, if they take turns speaking. Part-list cueing effect That being shown some items from a list and later retrieving one item causes it to become harder to retrieve the other items. Peak-end rule That people seem to perceive not the sum of an experience but the average of how it was at its peak (e.g., pleasant or unpleasant) and how it ended. Persistence The unwanted recurrence of memories of a traumatic event. Picture superiority effect The notion that concepts that are learned by viewing pictures are more easily and frequently recalled than are concepts that are learned by viewing their written word form counterparts. Positivity effect (Socioemotional selectivity theory) That older adults favor positive over negative information in their memories. Primacy effect, recency effect & serial position effect That items near the end of a sequence are the easiest to recall, followed by the items at the beginning of a sequence; items in the middle are the least likely to be remembered. Processing difficulty effect That information that takes longer to read and is thought about more (processed with more difficulty) is more easily remembered. Rosy retrospection The remembering of the past as having been better than it really was. Self-relevance effect That memories relating to the self are better recalled than similar information relating to others. Source confusion Confusing episodic memories with other information, creating distorted memories. Spacing effect That information is better recalled if exposure to it is repeated over a long span of time rather than a short one. Spotlight effect The tendency to overestimate the amount that other people notice your appearance or behavior. Suffix effect Diminishment of the recency effect because a sound item is appended to the list that the subject is not required to recall. Suggestibility A form of misattribution where ideas suggested by a questioner are mistaken for memory. Telescoping effect The tendency to displace recent events backward in time and remote events forward in time, so that recent events appear more remote, and remote events, more recent. Testing effect The fact that you more easily remember information you have read by rewriting it instead of rereading it. Tip of the tongue phenomenon When a subject is able to recall parts of an item, or related information, but is frustratingly unable to recall the whole item. This is thought to be an instance of “blocking” where multiple similar memories are being recalled and interfere with each other. Travis Syndrome Overestimating the significance of the present. It is related to the enlightenment Idea of Progress and chronological snobbery with possibly an appeal to novelty logical fallacy being part of the bias. Verbatim effect That the “gist” of what someone has said is better remembered than the verbatim wording. This is because memories are representations, not exact copies. Zeigarnik effect That uncompleted or interrupted tasks are remembered better than completed ones. Adaptive bias – basing decisions on limited information and biasing them based on the costs of being wrong. Misinterpretations or misuse of statistics; innumeracy. A 2012 Psychological Bulletin article suggested that at least eight seemingly unrelated biases can be produced by the same information-theoretic generative mechanism that assumes noisy information processing during storage and retrieval of information in human memory. People do appear to have stable individual differences in their susceptibility to decision biases such as overconfidence, temporal discounting, and bias blind spot. That said, these stable levels of bias within individuals are possible to change. Participants in experiments who watched training videos and played debiasing games showed medium to large reductions both immediately and up to three months later in the extent to which they exhibited susceptibility to six cognitive biases: anchoring, bias blind spot, confirmation bias, fundamental attribution error, projection bias, and representativeness. Debiasing is the reduction of biases in judgment and decision making through incentives, nudges, and training. Cognitive bias mitigation and cognitive bias modification are forms of debiasing specifically applicable to cognitive biases and their effects. Now that you’re up to speed on the cognitive biases you’re informed enough that you can start throwing yellow flags and red cards at your discretion. Great work! We started at roughly the same time and I admit your collective has rocketed forward; we plug along. I would like to feature a graphic you displayed in early January in a post re-introducing my audience to yours. It is the lotus-like cognitave connections graphic above however; if you would not mind, I would like the original all teal, line drawing. It is the one of many beautifully rendered, visual learner tools, I responded to immediatly. I can mirror in my image directory with a link-back or link directly; which ever you prefer.